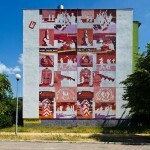 The mural was painted in shades that echo the colours of the Polish flag. It is an interpretation of photographs taken during a typical summer’s day in Westerplatter, the place which witnessed the outbreak of World War Two. This is why we can see a pirate flag from a souvenir stall next to Major Sucharski’s uniform. The work illustrates the process of metamorphosis and the blotting out of details that collective memory of historical events is subject to.